The SAFARI Montage® T-640 server offers maximum system performance with an ultrafast Quad Core Intel® Xeon® E3-1271 V3 processor and ample expandability with six hard drive bays. Manufactured by SAFARI Montage, this server has been custom-configured and optimized for high-quality video playback on the SAFARI Montage® platform. 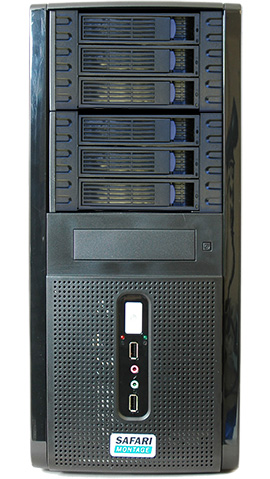 With six hard drive bays, the T-640 provides the storage capacity for thousands of hours of created content and expansion capacity to meet future growth needs. All servers come pre-loaded with the SAFARI Montage® OS and the appropriate number of Core Content hard drives to match your order. With each installation, SAFARI Montage carefully evaluates district needs and bandwidth to develop customized system recommendation tailored specifically for that district. Video Streaming Library, Learning Object Repository, Digital Lesson Tools, IPTV, Network-DVR, SAFARI Montage SupeTube™ and SAFARI Montage Live-5! One-year limited warranty. Purchase of a SAFARI Montage server is subject to warranty terms and conditions. The software that accompanies the server is licensed and protected by copyright. Extended Hardware Warranty coverage can be purchased. The Extended Warranty includes the repair and/or replacement of defective server(s) and/or hard drives(s). 95% E-Rate Eligible | For pricing and more information, call 800-843-4549 or email cs@safarimontage.com. The SAFARI Montage® RM-540 server offers maximum system performance with an ultra-fast Quad Core Intel® Xeon® E3-1271 V3 processor and future expandability with five hard drive bays. Manufactured by SAFARI Montage, this server has been custom-configured and optimized for high-quality video playback on the SAFARI Montage platform. With five hard drive bays, the RM-540 provides the storage capacity for thousands of hours of created content and expansion capacity to meet future growth needs. All servers come pre-loaded with the SAFARI Montage® OS and the appropriate number of Core Content hard drives to match your order. With each installation, SAFARI Montage carefully evaluates district needs and bandwidth to develop a customized system recommendation tailored specifically for that district. The SAFARI Montage® RM-810 is a 2U server, offering maximum system performance with an ultra-fast 10-Core Intel® Xeon® processor, superior expandability with eight hot-swappable hard drive bays and redundant network connectivity. Completely scalable and manufactured by SAFARI Montage, this server has been custom-configured and optimized for high-quality video playback on the SAFARI Montage® platform. With eight hard drive bays, the RM-810 provides storage capacity to store thousands of hours of created content and more than adequate expansion capacity to meet future growth needs. 1In comparison to prior generation. 2 High endurance, enterprise, solid state OS drives available as an upgrade (requires additional purchase). The SAFARI Montage® RM-1210X server offers superior system performance with an ultra-fast 10-Core Intel® Xeon® processor, massive expandability with 12 hot-swappable hard drive bays, redundant network connectivity and a hot-swappable power supply. Completely scalable and manufactured by Dell®, this server has been custom-configured and optimized for high-quality video playback on the SAFARI Montage® platform. With 12 hard drive bays, the RM-1210X provides storage capacity to store thousands of hours of created content and more than adequate expansion capacity to meet future growth needs. SAFARI Montage carefully evaluates each district's needs and bandwidth to develop a customized system recommendation tailored specifically for that district. SAFARI Montage servers come pre-loaded with the SAFARI Montage OS2 and the appropriate number of content drives to meet the district's needs. Video Streaming LIbrary, Learning Object Repository, Digital Lesson Tools, IPTV & Live Media Streaming, Network-DVR, SAFARI Montage SupeTube™ and SAFARI Montage Live-5! Three-year limited warranty. Purchase of a SAFARI Montage server is subject to warranty terms and conditions. The software that accompanies the server is licensed and protected by copyright. Extended Hardware Warranty coverage can be purchased. The Extended Warranty includes the repair and/or replacement of defective server(s) and/or hard drives(s). 1 In comparison to prior generation. 2 High endurance, enterprise, solid-state OS drives available as an upgrade (requires additional purchase). Dell and the Dell logo are trademarks of Dell Inc. Intel and Xeon are registered trademarks of Intel Corporation. 95% E-Rate Eligible (Note: If using the server to support a WAN, the server is 91% eligible) | For pricing and more information, call 800-843-4549 or email cs@safarimontage.com. The SAFARI Montage® WAN-1220 is a true enterprise-class server, offering maximum system performance with dual, ultra-fast 10-Core Intel® Xeon® processors, massive expandability with 12 hot-swappable hard drive bays and full redundancy with dual, hot-swappable power supplies, redundant network connectivity and dual, mirrored OS drives. Completely scalable and manufactured by SAFARI Montage, this powerhouse server is perfectly suited as the backbone of a district's digital media management solution. With 12 hard drive bays, the WAN-1220 offers the largest storage capacity of our server offerings to store thousands of hours of district-created content and ensure the capacity to meet growing storage needs. All servers come pre-loaded with the SAFARI Montage® OS2 and the appropriate number of Core Content hard drives to match your order. With each installation, SAFARI Montage carefully evaluates district needs and bandwidth to develop a customized system recommendation tailored specifically for that district. 91% E-Rate Eligible | For pricing and more information, call 800-843-4549 or email cs@safarimontage.com. The SAFARI Montage® WAN-1220X is a true enterprise-class server, offering maximum system performance with dual, ultra-fast 10-Core Intel® Xeon® processors, massive expandability with 12 hot-swappable hard drive bays and full redundancy with dual, hot-swappable power supplies, redundant network connectivity and dual, mirrored OS drives. Completely scalable and manufactured by Dell®, this powerhouse server has been custom configured and optimized for high-quality video playback on the SAFARI Montage platform. With 12 hard drive bays, the WAN-1220X offers the largest storage capacity of our server offerings to store thousands of hours of district-created content and ensure the capacity to meet growing storage needs.